The World Economic Forum recently released a report claiming that 5 million jobs will be lost to automation by 2020. The media often use the phrases “Robocalypse” or the “Fourth Industrial Revolution” to serve as ominous warnings that robots are coming for your livelihood. As a small business owner, is this something that you or your employees should lose sleep over? Our analysis reveals that the answer is no. Automation will wipe out millions of jobs, but it will also create millions of new opportunities. As an entrepreneur, you need to prepare and be in a position to capitalize on these opportunities. If automation were truly a job killer, then you’d expect to see the unemployment rate steadily increasing since the advent of more technology over the last several decades. 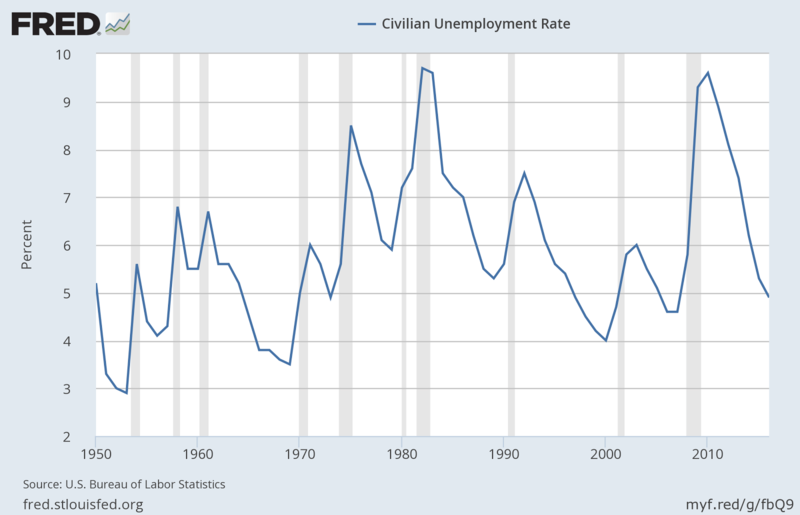 In fact, unemployment in the US has fallen to one of its lowest levels in over five decades. As of August 2017, the national unemployment rate stands at 4.4 percent, a 10-year low. As the graph below indicates, US unemployment has had ups and downs over the years, but a higher unemployment rate has never coincided with increased use of technology. Far from causing an increase in the unemployment rate, automation has actually increased job opportunities for Americans. Amazon, US manufacturing, and Uber serve as great examples that automation creates new job opportunities. An Amazon employee named Nissa Scott used to spend ten-hour shifts manually lifting plastic bins that can weigh up to 25 pounds. Now, Scott supervises a robotic arm performing the same task. The e-commerce behemoth grew its robot workforce by 50 percent in 2016. However, the company did not lay off 50 percent of its workforce. On the contrary, its goal is to hire 100,000 more employees before the second half of 2018. 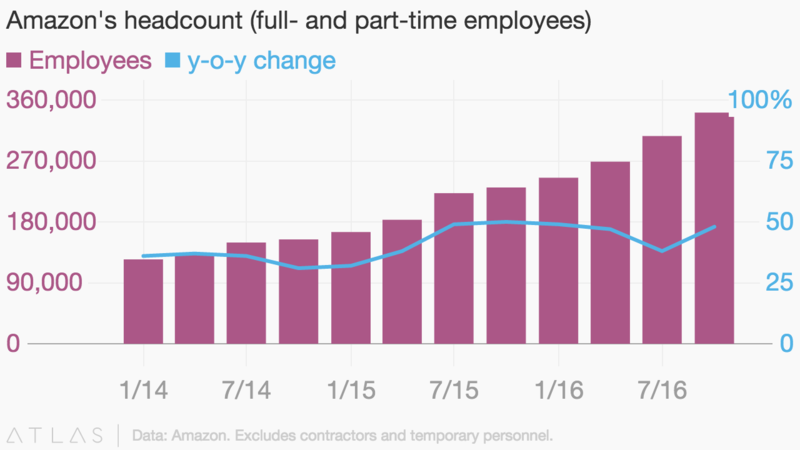 The mass hiring of workers mostly involves jobs in Amazon’s warehouses. Workers may stock warehouse shelves with items, follow instructions on computer screens and pick items off the shelves, or troubleshoot robots. These tasks require decision-making and fine motor skills. Robots, on the other hand, are in charge of the heavy lifting and transport merchandise from one corner of the warehouse to the other. They increase productivity while taking over physically exhausting work. As a result, a customer who just remembered that it his spouse’s birthday today can order an item and receive it just in time for their dinner celebration. Robots are actually helping to facilitate a decrease in outsourcing and an increase in manufacturing jobs within the US. With rising labor and energy costs in developing countries like China, companies are instead investing in cost-efficient robots and hiring US employees for the jobs that can’t be automated. This trend is called “reshoring,” where companies are forced to create products in the US because of increasing production costs in the developing world. From 2000 to 2009, the US manufacturing industry lost over 5 million jobs, mostly to China and Mexico. 2010 was the year when employment outlook in the industry was bleakest, but then something unexpected happened. US manufacturing companies started hiring more workers. From 2010 – 2012, the manufacturing labor force ballooned by nearly half a million. The sector also managed to reverse the $133 billion reduction in monthly factory output during the height of the recession to accelerate shipments by $1.4 trillion between 2009 – 2013. 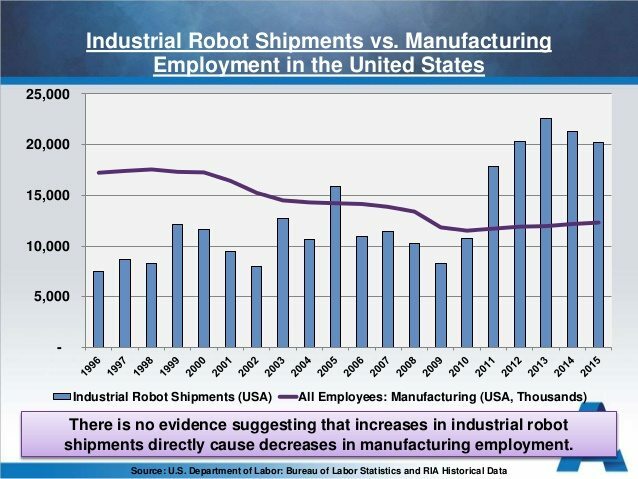 Around the same period, the number of robots being used by businesses and manufacturers increased. The automotive industry along with electronic components and appliances manufacturers have mostly led the reshoring initiatives. 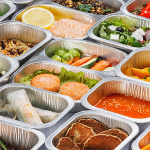 It appears that the cooperation between humans and robots in the assembly line is a reliable strategy to keep costs down and maintain high-quality production. Uber gives us another example of how automation reshuffles workers and creates new opportunities. The advent of driverless technology potentially casts a dark cloud on the future of Uber drivers. Uber has pushed to implement autonomous vehicles, and if you remove drivers from the equation, Uber gets to keep 100 percent of the fares instead of the usual 30 percent (drivers take home 70 percent). Consumers also win because fares will be significantly cheaper as Uber’s costs go down. On the surface, it seems everyone wins except the drivers. “If you’re talking about a city like San Francisco or the Bay Area generally, we have, like, 30,000 active drivers. We are going to go from 30,000 to, let’s say, hypothetically, a million cars, right? But when you go to a million cars, you’re still going to need a human-driven parallel, or hybrid. And the reason why is because there are just places that autonomous cars are just not going to be able to go or conditions they’re not going to be able to handle. And even though it is going to be a smaller percentage of the whole, I can imagine 50,000 to 100,000 drivers, human drivers, alongside a million-car network. New jobs, such as car fleet maintenance, will be created as more autonomous vehicles take to the streets. It’s always easier to see the jobs that will be eliminated than to imagine the jobs that will be created. A quick look back might give us a clue of what lies ahead. The American Industrial Revolution in the late 19th century saw agriculture as one of the first victims of automation. The National Bureau of Economic Research shows that over half of the country’s workforce was employed in farming during the 1850s, which gradually dwindled to 40 percent by 1900 and kept dwindling from there. Currently, only about 1.5 percent of the US population is employed in agriculture. However, the overall unemployment rate remained under 5 percent throughout most of that time because the decrease in agricultural occupations was offset by the growth of jobs in new industries born during the revolution. Farmers worked hard and received low pay. According to a historical entry, farmers received 50 cents per day while construction workers were paid $3.25 a day. Plenty willingly abandoned their farms to look for work in urbanized cities. Many found work in factories and mines. Others worked in transportation or construction, building railroads and establishments. A laborer who worked hard and increased his repertoire of skills always found better jobs. The railroad construction sector swelled from 81,790 to 415,967 workers from 1860 to 1880. From 1880 – 1920, the manufacturing sector exploded from 2.5 million to 10 million workers. Overall, employment skyrocketed from 8.25 million in 1850 to 41.6 million in 1920. 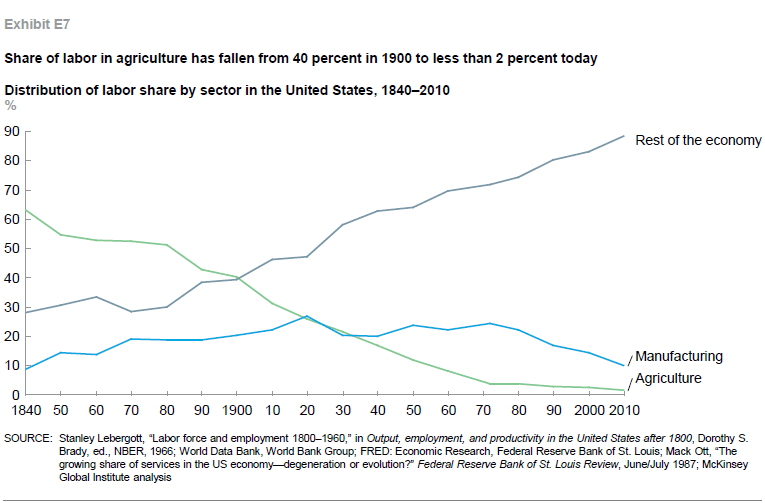 During this time of tremendous job growth, the agricultural sector employed a smaller share of the population. The same thing that happened with farming is happening as the Fourth Industrial Revolution gathers momentum. As businesses rely on automation to complete monotonous activities, employees are shifting to higher paid, higher skilled roles. 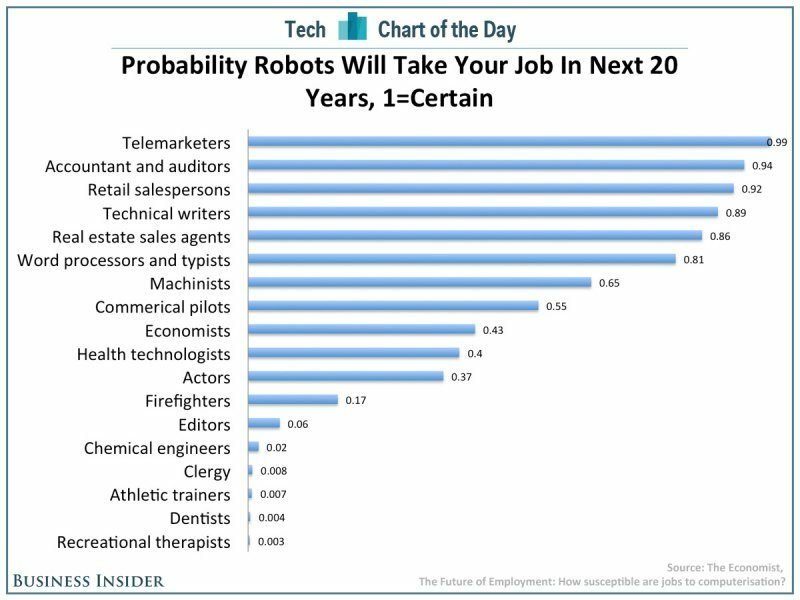 In 2013, Oxford researchers predicted the probability of automation for 702 occupations. Not surprisingly, they discovered that low-paid and low-skilled occupations are most likely to be automated. Clerical, telemarketing, sewer, and data entry jobs have a 99 percent probability to be computerized. These jobs will be eliminated, but overall people will be doing much more interesting work. As repetitive and less than exciting jobs are taken over by robots, employees will focus more on the ‘human’, creative part of the work. Similarly, a McKinsey research study analyzed 2,000 work activities from 800 jobs to assess their potential for technical automation. The study revealed that 60 percent of jobs have at least a 30 percent potential for automation, but the tasks that are left over will enable employees to leverage their social, emotional, and cognitive capabilities. For instance, some tasks of a retail salesperson can be computerized, such as ringing the cash register, restocking inventory, and maintaining the cleanliness of the store. However, this enables the salesperson to spend more time interacting with customers. So instead of sweeping the floor or carrying boxes, the job becomes more interesting to the employee as he invests more time in engaging the customer to deliver personalized solutions. And in fact, this could mean increased revenue for the business as millennials and other key customer groups crave personalized services. Small businesses are the backbone of the US economy, accounting for 99.7 percent of US businesses. 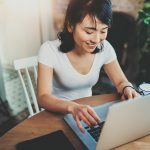 Many small business owners struggle to grow because they are often saddled with non-revenue producing tasks, such as taxes, hiring, payments, database management, encoding, and so on. If some these tasks could be automated with accuracy, small business owners will have more time to focus on their unique value proposition. In preparation, entrepreneurs must first be aware of the jobs that are most likely to be taken over by robots. Automating these jobs frees up capital which could be diverted to revenue-producing activities. For example, a recruitment firm relies on entry level employees to manage the company’s database and candidate sourcing. If these tasks are computerized, the company can hire skilled recruiters who can get to know candidates better and help them find great job matches. Small businesses that are agile can capitalize on automation to streamline operations, increase efficiency, and generate more profits. As a result, the company has more funds which can be used to invest in training entry level employees to become legitimate recruiters. Ultimately, automation triggers an upward cycle that helps workers reach their full potential and stimulates business growth. Robots are only coming after jobs that no one wants to spend their entire life doing. A janitor mopping floors or wiping glass doors most likely took the job out of necessity. This is the same case for data entry keyers, telemarketers, etc. It is simply not in our nature as humans to aspire for jobs that do not challenge our skills or pay enough to take care of ourselves and our families. What is in our nature is to seek growth in terms of skill, wealth, and social stature. 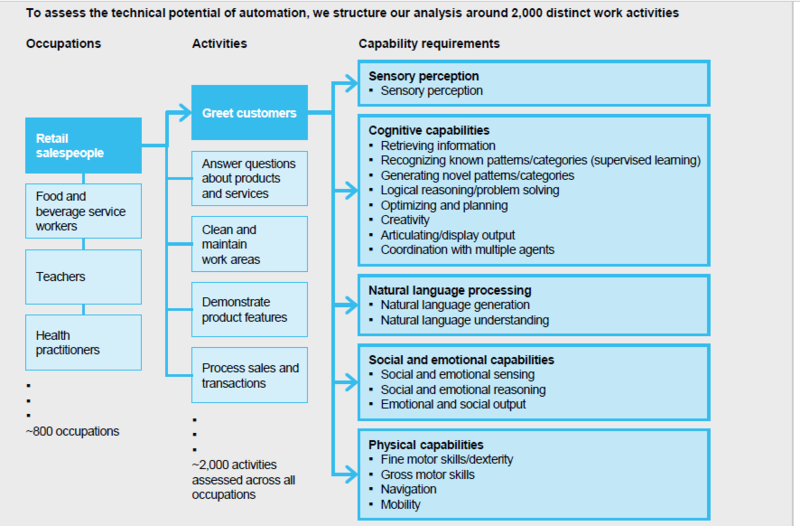 Our analysis reveals that automation facilitates success in these areas. When robots enter the picture, companies invest in innovation. They create new and better opportunities. They also train employees to pick up new skills so they can occupy positions created by automation. Entry level employees become fleet supervisors or specialists. As their skills grow, so do their income and position in society. Essentially, if you argue against automation, you argue against the worker. Robots will erase millions of jobs, but there’s no need to panic. Our analysis reveals that new and better roles tend to be created when tasks are automated. As a small businesses owner, you should gradually shift your operations toward automation, so you can devote more time and effort into leveraging your specialization. Do you agree with our findings that robots will take away jobs but new, better roles will be created? Share your thoughts in the comments section. The first is considering that the data series from the impact of the first and second industrial revolutions apply to what is happening today (i.e. jobs were created, not destroyed, back then, even if automation increased exponentially, from basically zero to automated factories with production lines). There is a huge difference: what happened during those two revolutions was that people who had skilled jobs (say, weaver, or even clockmaker, and most certainly also the kind of farmer who used a lot of inefficient manual labour, before the advent of the agricultural revolution of the late 1700s) lost them to automation, yes, but they were also able to join the factories as unskilled labour and thus survive, even though under much harsher conditions. In other words: rural jobs, and manual jobs, were indeed lost, but factories needed workers, and they would take anyone, skilled or unskilled, to do completely different jobs (much simpler ones, in fact) under the same roof. So there was a widespread move from the rural areas to the suburban ones where factories were established; there was social upheaval; people earned much less and worked under dire conditions; but the truth is that they did continue to be needed, even if only as cheap, replaceable labour. Now, with the current generation of automation, you don’t even need cheap unskilled workers: AIs and robots can do such jobs pretty easily. The notion that these people will be able to do something more productive is a fallacy: someone who barely managed to finish high school and is flipping burgers at MacDonalds, once he’s replaced by a robot, will hardly get a job as a chemical engineer. And this is going to be applied to literally hundreds of millions of unskilled people — who are unable to ‘convert’ to more intellectual/emotional kinds of careers, either due to lack of education, age, social conditions, etc. The second issue I’ve got with your more recent data is, well, it’s recent: you can certainly predict the next five years based on data from the past twenty years, but… what about the next 20 years? The next 50? Robots and AIs from twenty years ago do not come even close to what they can achieve today; and we can only conjecture what they will be able to do in 20 years from now. So, the assumption that the unemployment rate continues to fall in spite of increased automation is valid for today (or tomorrow), since it’s based on what robots and AIs can do today, and the cost of investing in such technologies to replace humans today. But in twenty years we might have a sentient Siri on our mobile phones (we simply don’t know!) which can also be connected to our car and drive it for us. When we have that kind of technology, and when it’s cheap enough to become ubiquitous, we cannot predict how fast it can replace current, existing jobs; and we also cannot predict how quickly people can be reconverted to do new jobs that are impossible to automate. In fact, the argument ‘impossible to automate’ is a dated one: each new generation of AI and robots shows that what was impossible yesterday is achievable today, and will be done by a cheap machine tomorrow. And here is where the predictions start to fail and break apart. I can imagine that there will indeed be a further decrease in the employment rate in the short future, but the big question — if nothing is done — is what happens once AIs and robots are not only available, but way cheaper to deploy, and start filling all niches on the job list — even chemical engineers. Sure, that is still some way off, and I will agree that we do not need to worry in the next five to ten years. But the next generation should really start to worry about their immediate future. Education, of course, will postpone the chance that one’s job will be replaced; and perhaps the biggest challenge for governments today is to reinforce the idea that everyone really needs to get a higher education, and get it now, lest their job becomes obsolete in a question of years; a higher education might just mean surviving without being replaced until the retirement age… but even that will not be guaranteed, it will just have a higher probability of success. We’ve got over 1500 posts with questions and commentaries from smart savvy readers and small ebusiness owners like you. Join the conversation.